This document is part of Subvolume C ‘Alloys and Compounds of d-Elements with Main Group Elements. 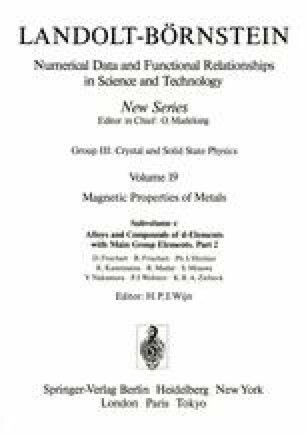 Part 2’ of Volume 19 ‘Magnetic Properties of Metals’ of Landolt-Börnstein - Group III Condensed Matter. Al-Mn-Ni: Ni2MnAl. Al-Mn-Rh: Rh2MnAl. Ga-Mn-Rh: Rh2MnGa. Ge-Mn-Rh: Rh2MnGe. In-Mn-Rh: Rh2MnIn. Mn-Pb-Rh: Rh2MnPb. Mn-Pd-Sb: Pd2MnSb. Mn-Pd-Sn: Pd2MnSn. Mn-Rh-Sb: Rh2MnSb. Mn-Rh-Sn: Rh2MnSn. Mn-Rh-Tl: Rh2MnTl.